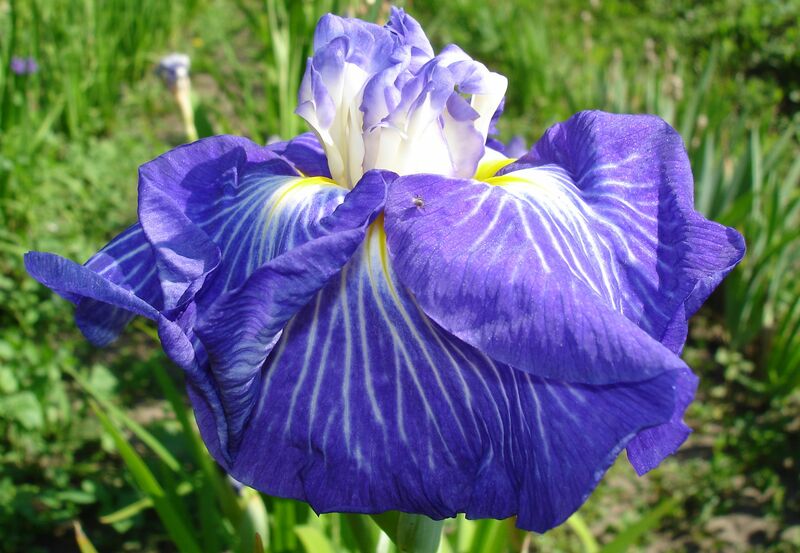 Information from the State Commission of the Russian Federation for Selection Achievements Test and Protection website: Iris ensata. Plant height of 87 cm, with stems from 6 to 17. The leaves are green. Peduncles strong, straight, branched, length 50 cm Number of flowers per peduncle 3-4 pieces flowers with a diameter of 16 cm, height 7,5 cm, blue with white stripes. Petals broad, rounded, corrugated. Aroma is absent, color does not fade. The flowering period of 16-19 days, beginning with the 4th of July. According to originator, the variety is resistant to diseases and pests, adverse weather conditions, winter-hardy. Recommended for decoration of flower beds and shores of the July flowering, for forcing and cut flowers in the steppe and forest-steppe zones of Russia.